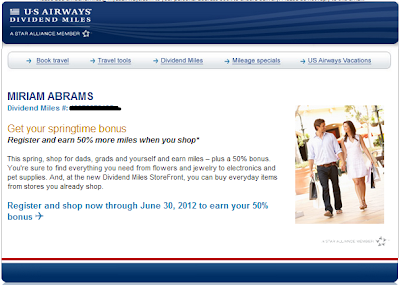 Through June 30, 2012, you can earn 50% more miles when shopping through the US Airways Dividend Miles Shopping Portal, but you must first register. Click here to register for US Airways Springtime 50% bonus. a purchase. Transactions must have an Eligible Activity Date between May 14, 2012 and June 30, 2012 to qualify for the Bonus... Bonus miles will begin posting on May 26, 2012 and continue posting every other week until the last posting September 29, 2012.US Airways assumes no responsibility for how qualifying partners count qualified transactions or record eligible activity dates; some partners record eligible activity dates based on completion of the required activity (for example, delivery of the item purchased including delivery of flowers). You must check with the participating partner to confirm how the partner records eligible activity dates and what counts as a qualified transaction. The last date that activity from a qualifying partner must be received by US Airways for Bonus miles consideration is September 28, 2012, regardless of the Eligible Activity Date for such activity.